I can confirm that it is a good tweet. 2200 RTs and almost 6000 likes? I have a feeling your next guest will be hearing about this...hopefully he-she responds more positively than Zelkovich did upon hearing your Pompey story! My next guests are Alan Cross and Michael Hainsworth. Alan has likely had tweets blow up like this. What's most interesting to me is the number of engagements not correlating into new followers. You'd think a tweet with 400,000 impressions and 25,000 engagements would result in more than two new followers! That is very odd...you'd definitely assume a viral tweet like yours would lead to more followers. Did you get a notification for each like and retweet? I wonder how celebs with millions of followers handle the landslide of notifications. I long ago turned off the notifications, but I periodically check them in Tweetdeck because I like to reply to people who ask questions or direct comments at me or whatever. The past couple of days this has been tough b/c of this tweet. I was curious if it was my most popular tweet of all time because I had a very popular tweet about Batman Joker's representing the drug of choice in their respective decades and according to https://analytics.twitter.com/user/torontomike/tweets this is number one with a bullet. Interesting case study, that's for sure. Well, considering all the garbage online, it's great that a fun tweet like yours got so much recognition! Who was the "biggest name" to RT it? I don't know much about Twitter but I'm sure someone with some social media sway had to have enjoyed it for it to get that popular. I'd like to point out that I was one of the first people to like your tweet . I actually have no idea if any "big names" RT'd it... it just sort of caught on and snowballed. The dude who wanted the free nuggets from Wendy's got over 3 million retweets so I have some work to do. This is going to be a tough act to follow. Maybe this can be your most popular blog post ever! Hit the duck-daily-double. I'm told Jon Cryer RT'd this tweet. That's right, Ducky helped spread the Toronto Duck love. Can you work in a question about Alan Cross's ajournalofmusic.com attracting Cobaine & Cornell suicide conspiracy nutters? As my history prof would say back in the day, "My word!" How have you not been interviewed by Ann R on CP24 about this yet? Because she's resting her voice until August. 5-1 says she's taking a class in aviation in order to start the cycle over again. You may have been ripped off (honoured?) this morning on Newstalk 1010, as during the 8:45 roundtable one of the panelists used that line. 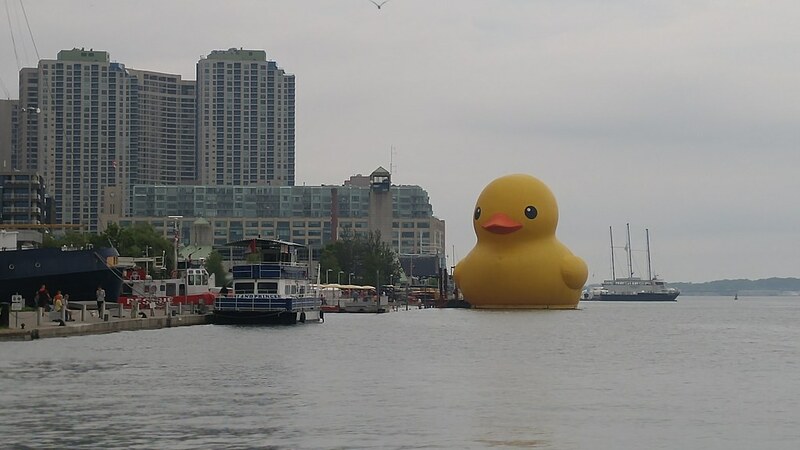 Where did they take the duck next?